Beside their anti-commercial name Druids of the Gue Charette are quite possibly the best blend of psychedelic classic rock and modern garage fuzz ever heard. Bands either have too much classic rock and not enough modern in them or vice versa, but Druids of the Gue Charette somehow have found the balance between the two (and it's not 50/50) that just works! The fact that you can hear these two things at once without really realizing it- because it's not like the song stops and goes modern when it's classic, it just flows and blends so seemlessly- just goes to show you how truly amazing and special this record is and will be for time to come. 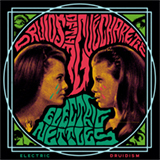 The Electric Nettles are nothing less than the Druids twin band.